It is necessary to measure Air Fuel Ratio (AFR) to reduce exhaust emissions and to save fuel economy. 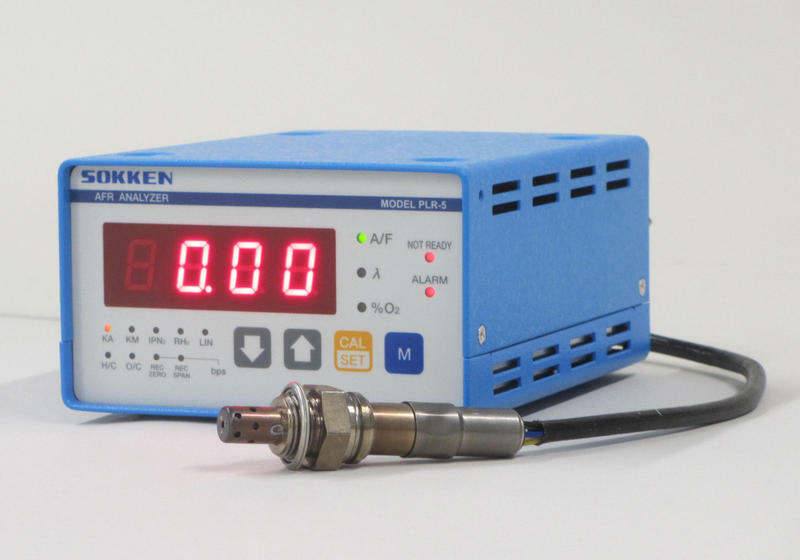 Sokken provide the two types of Air Fuel Ratio Meter of a high precision model and a portable one. 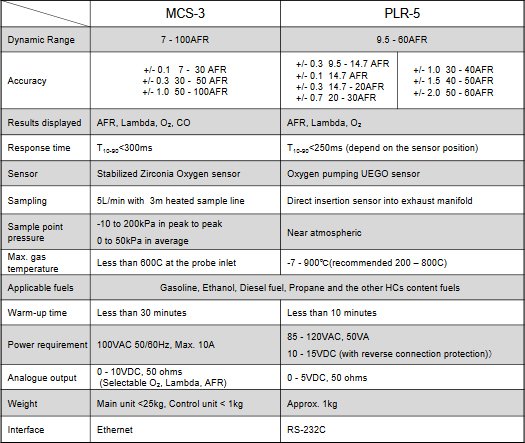 MCS-3 is capable to measure high precision AFR without to be influenced by the coexistence unburned gases such as HCs and CO in rich combustion exhaust gas. 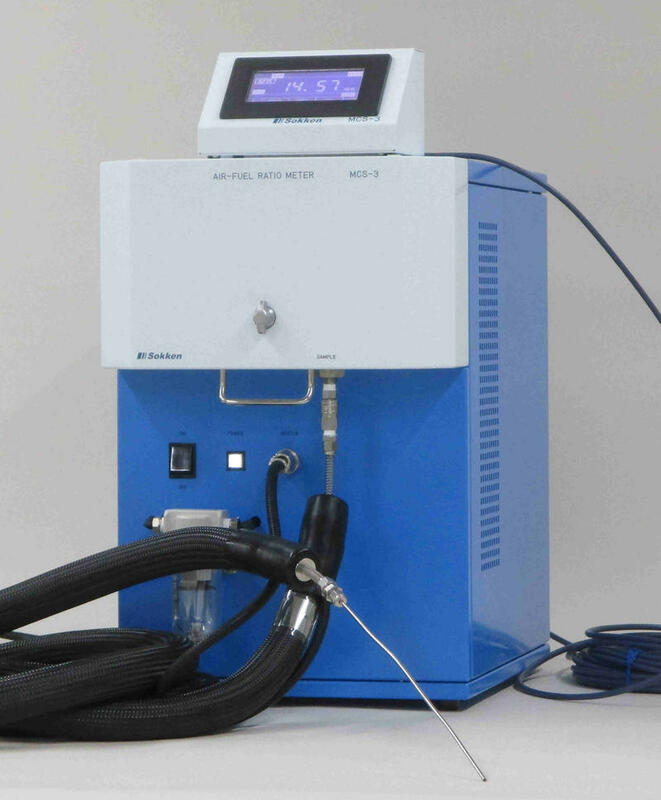 The MCS system mainly consists of metering capillaries for sample gas and air, catalyst and a Zirconia Oxygen sensor. The Oxygen concentration is measured by Zirconia sensor after the unburnt gases were fully oxidized over catalyst. 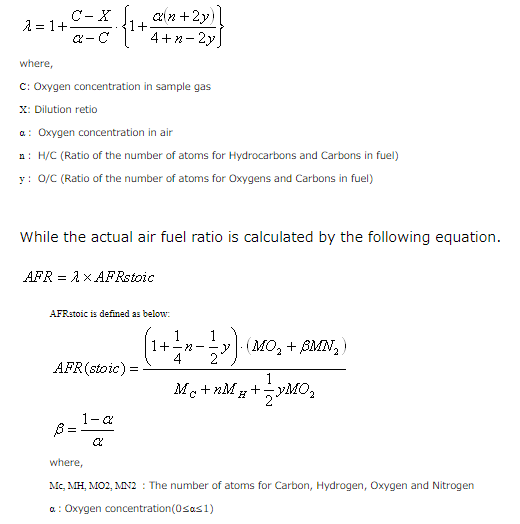 The AFR is calculated by the Oxygen concentration and the dilution rate. 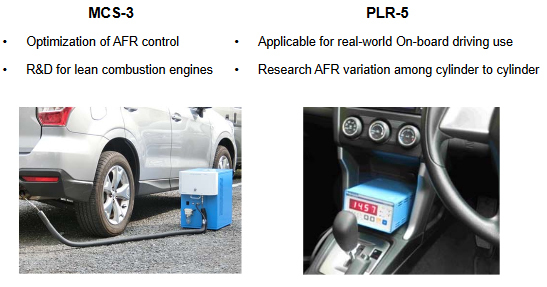 PLR-5 is the small and light weight air fuel ratio meter by using multiple layered UEGO sensors. It is simple to use by installing the UEGO sensor to exhaust pipe. 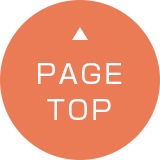 Are both instruments for MCS-3 and PLR-5 applicable for Alcohols fuel? Yes, of course they are by changing the H/C and O/C ration. How often the service interval for catalyst? The catalyst shall be replaced every 200 hours in the integration time. Is it possible to get another new UEGO sensor? The system is configured with a pair of metering capillaries to dilute the sample gas with air, an oxidation catalyst and also a solid stabilized Zirconia sensor. 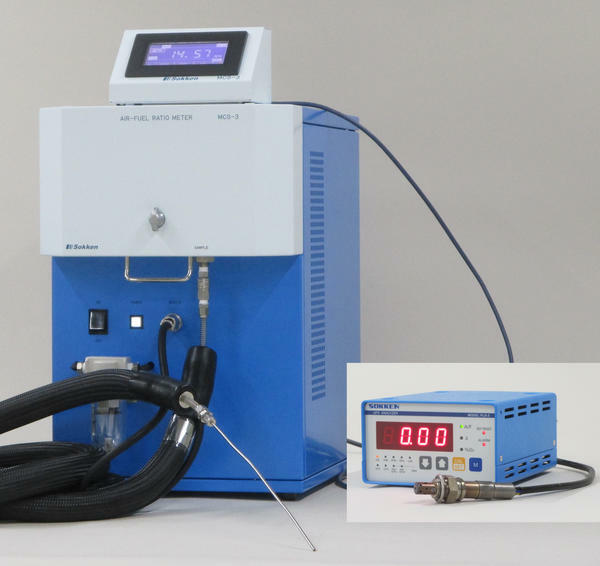 The oxygen concentration is measured by Zirconia sensor after the oxidation catalyst without diluting the sample gas with air in lean region since the oxygen molecule is still remaining in the exhaust sample gas. However there is no oxygen molecule in the sample gas in rich region, so it is necessary to dilute the sample gas with known amount of air and oxidize the unburnt gas such as HCs and CO to measure the oxygen concentration after the oxidation catalyst. A Platinum coated Zirconia ceramic thin layer generates ElectroMotive Force (EMF) at the both sides of the layer if there is an Oxygen concentration difference under very high temperature condition. 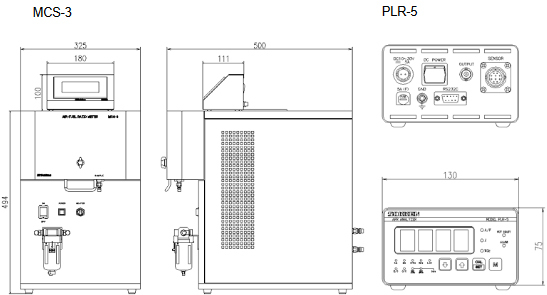 PLR-5 uses the multi layered thin Zirconia ceramic sensor for On-board type of air fuel ratio control sensor called UEGO sensor. For lean region in Lambda>1, the sensor controls the oxygen concentration in the upper cavity to zero by pumping the oxygen molecule to control the current Ip in the circuit as shown the red arrow in the diagram. The Lambda and AFR are calculated from the Ip as shown in the graph. For rich region in Lambda<1, the sensor controls the upper cavity to oxidize H2 and CO perfectly by pumping the required oxygen molecule to control the current Ip in the circuit as shown the blue arrow in the diagram. The Lambda and AFR are calculated from the Ip as shown in the graph. 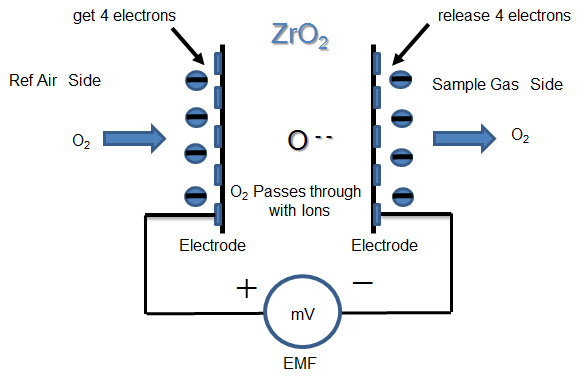 Since the lower cavity as a reference side of the electrode, the oxygen concentration in the lower cavity keeps always constant to control the reference PSU current as shown in the diagram.